Store Manager for CubeCart is a Windows application to quickly and effectively manage your CubeCart online store. 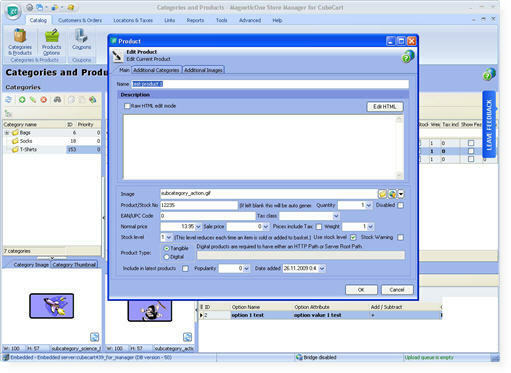 You can add, delete and update your products, categories and manufacturers, automatically upload your product images while editing products, categories, manufacturers, view reports, orders, export/import products, backup/restore database, manage product attributes, manage global store settings. All this from your desktop computer. ...... All this from your desktop computer. MagneticOne Store Manager for CubeCart was made for ordinary users not for computer specialists, only few settings required for program to start and it just works. Download demo version to get better understaning what it is. Qweas is providing links to Store Manager for CubeCart 1.0.3.159 as a courtesy, and makes no representations regarding Store Manager for CubeCart or any other applications or any information related thereto. Any questions, complaints or claims regarding this application Store Manager for CubeCart 1.0.3.159 must be directed to the appropriate software vendor. You may click the publisher link of Store Manager for CubeCart on the top of this page to get more details about the vendor.